THE BOSS of Germany’s central bank has warned that Britain could still crash out of the EU without a deal, saying “It’s not 100% sure” that a Brexit transition deal will be agreed. 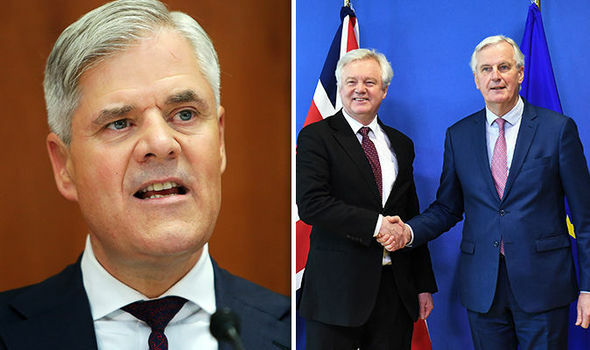 Bundesbank leader Andreas Dombret has dismissed optimism among business leaders following the announcement of a Brexit transition deal with the European Union, warning that substantial uncertainty still remains for UK businesses. Speaking on BBC Radio 4’s Today Programme, he said: “We need to hope for the best but prepare for the worst. “It’s not 100% sure that we will have a transition period. It’s not 100% sure we will have a free trade agreement. “The probability of having a hard Brexit is not high, but it’s also not zero. “By the middle of this year, we believe at the German central bank that its’s important to have started the application for a new license should one want to have a license in the EU27 to do business.Asked by host Nick Robinson if that meant there was a possibility that banks based exclusively in London could be barred from trading in the EU, he replied: “That’s exactly right. It goes beyond trading, that you’re not sure that you’re able to do business in the EU27, so you need that license.”Brexit Secretary David Davis and EU chief negotiator Michel Barnier announced in March that they had agreed a draft transition deal intended to ease business fears about a post-Brexit cliff edge. The deal followed an agreement over the size of Britain’s “divorce bill” for leaving the EU. Under the terms of the deal, the UK will remain bound by existing EU rules until the end of 2020. However, for the transition agreement to become effective London and Brussels must first agree on their long-term trade ties after 2020.